! - İzdihër - ! : Kaanch Ki Chooriyan (Glass Bangels). Remember my Chait Charrya post where I uploaded one Punjabi song called Chait Charrya ? I ain't forcing you to watch it ,but you known, in case if you are wondering what is was all about then for your information that was super happy wedding songs.Yeah all that stuff. Chill ! I am not getting married.But I can talk about wedding any time.The whole big thing super fascinates me.Mayao,Mehindi,Dohlki,Nika'ah ceremony and then Valima.Every day new threads to wear. I love the Nika'ah ceremony most .The whole bridegroom procession with band baja. Valima is more decent stuff. Super fun is Mayao and Mehindi ceremonies.Most of you will be calling it TOO much,which is,no wonder.The above mention functions are actually all ritual. The main thing is Nikkah and Walima.It's merely depends on ones personal choice.One can prolongs it as much as he/she wants. Actually, I am blabbering about all this because , in first week of March, one of my good friend is getting married ,and I picked that song for her Maayun dance.But her Punjabi cousins rejected that straight away with saying" It is too soft. "When I suggested Dandiyain ,they said,"Too girlie."Anyway! !I am off pickking songs for her .Way good!!! Arguing with them is like viscous circle. I can never win. They will do the Bangrah on fast numbers. I am totally out of touch from Punjabi numbers or even any Indian songs. It's been ages, I haven't heard any. Last movie I saw was Dabang and Band Baja Barat . However ,no intention of busing into Munni Badna'am or Shella Ki Jawani,either .....so oldies.Can you believe they were suggesting me that ??? What am I, Munni or Shelia? Seriously, what has happened to the Bollywood? They used to produce so many songs in a year .Now there are just few.And stories are so doomed.No typical heroin.No typical hero singing song and dancing around tree .No Shadi numbers .Sound effects so perfect . And NO villains!!!! I heard Sanjay Dutt has been blowing away everyone once again in his new Villain avatar.I really wanna see Agni pat for sure.DEAL!Also, Imran Khan's and Kareena Kapoor's new flick .What is the name ? My cable operator is such a ***** ,big time. Those were really days when we used to blare music from our radio and used to listen songs in public buses and school buses ride.Then cellphones and I-Pod came in and everyone got their stupid head phones and their own music library.Phew. Life is no more fun now.Bus rides has became way boring. Excuse me ,why I am talking about Music??? ?Hmm...because our weddings are never complete without music. Now back topic.So the friend who is getting married is my very very good friend. Out of sudden, month ago, she gave me this scoop of getting married and asked me to be her bridesmaid. I have said yes to her . I have indeed.You know, It is actually, it’s funny.I went to quite a few weddings last year, and I wasn’t a bridesmaid in any of them.Always guest So yes,it is gonna be fun .I am so psyched :). Pulse her two elder sisters are married and in different cities. They be here soon.Even her Bara'at is coming from Rawalpindi.One of her relative proposed her some zillion years ago . Her family was not interested at first.Now they had finally decided. These days just shopping is going on. Yesterday she came to my place and we went to the Samama Mall and picked her dresses from tailor .Today we went to the Magna mall,then to the Millenium mall.We actually wanted to shop from near by mall but things were OK there,so then we went to Paposh Bazar and bought her Mayaon dress . Paposh Bazar is ad'da of all stuff .Everything is available under one roof.And it is not fancy-over priced mall. She did her fair amount of sparing ,though,I was only interested in buying kanch ki chooriyan (Bangle),and jewelry.All my chooriyan are old .I have 8 sets so far but I want more ,more and more & those sets are definitely not enough,and the dress I'm wearing at her Mayyaon is lemon color Shalwar Kameez ,and teal color Sharara at her Nikkah .Her walima will be in Rawalpindi. 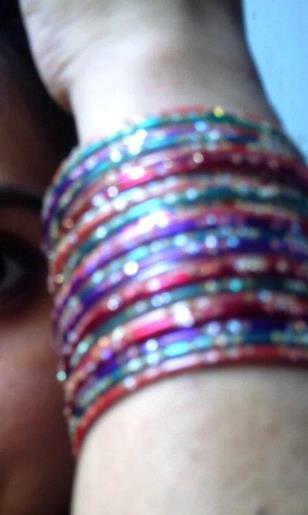 So what I am saying is every girl should have matching bangles. According to that I must get a new multicolor chooryian . Supper super happy. Mehindi wali is also booked from Rose beauty salon.I am also attaching pictures of Bangles I bought, so those who have no idea what bakwas I am saying will get a clear picture . On our way back , we ate at H-block. My food was chicken burger. She had prawn fried with rice. Poor gal is dieting .Oh we both drank fresk lime with soft drink. To be on level,I am hell tired after shopping ,and I don't know what the hell I am writing today. Never mind my blabbering .I even don't know title for my today's post either. I reckon it should be Kaanch Ki Chooriyan. On totally irrelevant note, I just saw that someone clicked +1 at the end of my Chait Charya post. What's the deal ?You must be laughing . This world is so self centered,I know . Everyone thinks about them self. It's my happy moment. I am happy for + 1, so shut up. Nevertheless,if you liked my today's post ,don't forget to click on + in the end. after her wedding i want to know more about all that situation of beeing bride made. i hope you write bout the rest if you don't mind . and thank you for telling us all this things. Lovely post and loved the colors! Hello izdiher ~~ I enjoyed your post. Good luck with being a bridesmaid. glad you enjoyed the jokes. Take care my friend. I love your little flower pointer - it is so cute. Love, Merle. woahhh~! the photos were amazing!!! You sound very happy and I hope you'll have a great time at your friend's wedding. You must be so excited to be the bridesmaid and all that. Very gorgeous wedding photos. Love them. Thank you for sharing, I have learned so much from your post and the photographs are really beautifully vibrant. Of course it is an adventure for you too, lovely that you were asked to be a bridesmaid. Hello Izdiher! Your blog is so beautiful! I wanted to thank you for joining my blog site Menopausalmother.blogspot.com I just joined your site as well on your Google Friend Connect, but it appears under the name Marcia Doyle, just so you know it's me! Izdiher, do you really know what is so fetching (attractive, charming) about you and your blog. It is ALL YOU! And, when others are affected by your happy joy over the 'little happenings' in life, they too enjoy more, complain less, and trust in their Creator--that's the road to peace! Your world seems so exotic to me. And I like your header. Thanks for following my blog. I will join your friends too. Have a beautiful week ! Your wedding looks exciting. In our part of the world, we don't have dance and music on wedding. Its just family get together, gossip, food and nikah...Brides wear silk saree. The reception usually takes place on the same day of nikah, but in some cases they extend it. Best wishes for your friend. And for you, enjoy your celebrations!! glass bangles are gorgeous! (((: i loved this post so much. GOOD GOOD POST! The wedding you're preparing for sounds amazing! I wish I could have seen it. I'm a Muslim like you but I'm a Malay Muslim so we have different traditions. The only thing we have the same is the akad nikaah. I'm not sure what walimah is but maybe we have that too but call it differently. I don't know how can I explain my feelings about your blog. First thing, I like the content of your blog, I like your effort to make your blog popular. Q no 01: Why did you choose this template? Q no02:Why don't you use Google adsense to earn money from internet ? Girl you've been tagged in an 11 questions post! They are so much more fun than the western weddings I have been to! Thank god a friend of mine tagged me for a fun blog tag, and since it's my turn, I would love if you would participate! Beautiful post girl... People should know about such informative events from around the world.. :) When's your turn.. Hahaha! KIDDING!!! Hello there! This is my 1st comment here so I just wanted to give a quick shout out and tell you I truly enjoy reading through your blog posts.